Cross-selling is basically suggesting complementary items along with the product customers have decided to buy. This is a sale tactic that increases the average order value (AOV) and extends customer lifetime value if applied successfully. Here are some tips and a recommended tool to effectively integrate cross-selling tips for Magento 2 websites. Cross-selling is about benefiting both sellers and buyers. While buyers can save time by purchasing supplementary products at once, the seller can increase sale revenue. As a seller, you should offer to cross-sell products that customers need. For example, suggesting a phone case for a person who buys a new phone is a smart cross-selling because that what they need and willing to buy. You want to make the additional purchase impulsive, not forcing them to buy more. Therefore, using social proof may seem old-fashioned but still very effective. For example: “Customers who bought this item also bought” by Amazon has been successfully used. If a customer buys a $100 swimsuit, it is sensible to suggest a $10 tower, but if the customer only buys a $10 tower, it doesn’t make sense to sell them a $100 swimsuit. You should only offer supplementary items that don’t cost more than 25% of the main product. To encourage customers to buy cross-sells products, you may need to apply other marketing incentives. You can use reward points, coupon, discount or free shipping to make the cross-sell offers seem more appealing to shoppers. Customers will surely be motivated to pay a bit more if they can earn additional benefits! But most importantly, you should only cross-sell item that has its high value and can be beneficial for customers. Don’t just use cross-sell to clear out the stock because selling defected product only risks losing the customer. If you notice at the checkout counter of the convenient store, there usually racks of the small item with low prices that customer can easily buy without much thought. This is also a cross-selling technique that can be applied for ecommerce. You should only offer small items on checkout page because customers have already had an idea of how much they will pay so small items are more reasonable. However, you can try larger cross-sell offer on the product page when they still decide what to buy. Magento provides several ways to promote your cross-sell items, but it is still limited (read more to know to find out the limitations of Magento 2 related products). Frequently Bought Together for Magento 2 is an effective tool to boost cross sale by gently promoting items in an eye-catching slider. 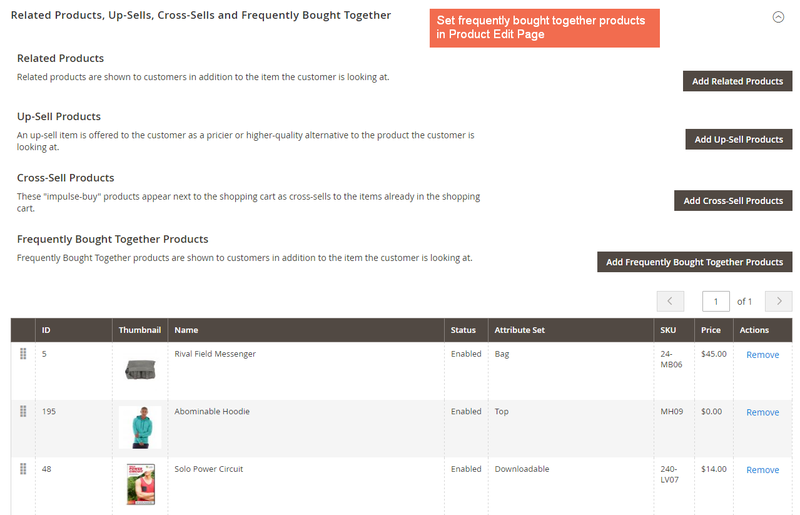 Different from Magento default, this module allows the customer to quickly add any product in Frequently Bought Together block to cart, and order multiple items or all items in this block to cart without loading new pages. For example, when checking a particular product, the extension will suggest other items that are commonly bought with it. 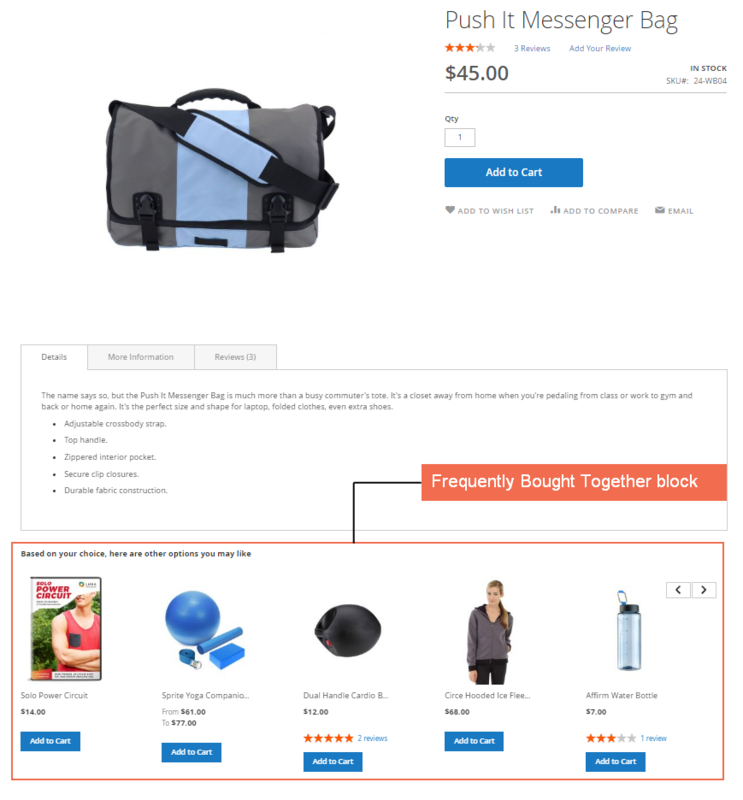 A customer can add multiple/all product in Frequently Bought Together block to cart at once. How does Frequently Bought Together for Magento 2 work? Frequently Bought Together includes an additional config on Product Edit Page just like related, cross-sell, up-sell product of Magento default. 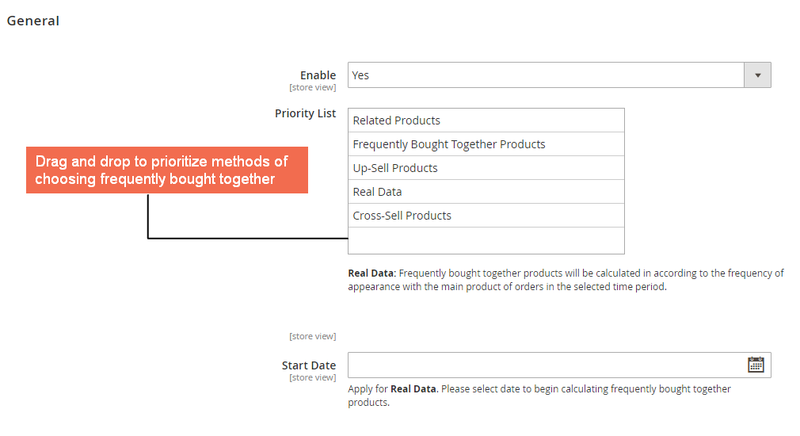 The extension can track products commonly bought together from real orders in purchase history (Real Data method). 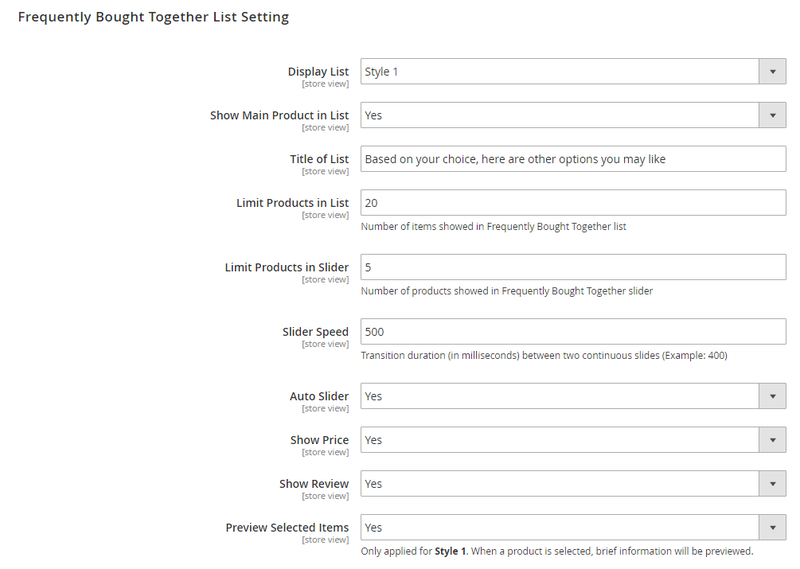 Admin can easily change set up and customize the design of the Frequently Bought Together block. Cross-selling is a simple yet effective way to make the most out of customers who come to your site. Don’t miss out the chance to maximize sale per customer!